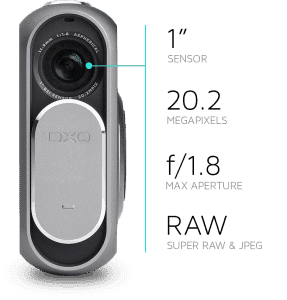 Join Gary Goldberg-Vistek’s Pro Product’s manager, on Saturday, November 26th from 11AM-2PM, at Vistek Toronto’s downtown location, to come in and try the DxO One Camera. This little gem is the perfect companion to anyone who owns an iPhone or iPad and makes the perfect holiday gift. We encourage you to download the App for your iPhone before you arrive at Vistek. We will have several stations set-up in our 2nd-floor seminar room where you can try the camera out and save your shots directly to your iPhone. Bonus: Anyone purchasing a DxO One while visiting will receive special promo pricing. Note: The DxO One Camera is compatible with lightning connection iPhones/iPads. It will not work with previous iPhone/iPad versions or Android devices.